We had an attorney phone call with Hasan late yesterday afternoon. (61) Any violation of any published institutional rules, regulations or procedures. Hasan read to us and discussed the detailed allegations, but we do not yet have a copy of the conduct report. They pertain to five different categories of activities. Hasan told us that most of his property has been confiscated. He has no pen, paper, kites, envelopes, stamps, or legal work. He is on hunger strike, having refused all meals beginning Saturday morning, July 28. There are a security barrier and sandbags outside his cell door (presumably to prevent anyone from passing anything to him). He was told by the chairman of the Rules Infraction Board that they were considering referral of the matter to the Serious Misconduct Panel. See AR 5120-9-08.1, Disciplinary procedures for violations of inmate rules of conduct before the serious misconduct panel. This is a relatively new Administrative Rule, effective 2/11/2017. The Serious Misconduct Panel determines guilt and can recommend a change in security level, to be affirmed by the Chief of the Bureau of Classification. The conduct report was signed by Brian Wittrup who, as of 2017 at least, was chief of the ODRC Bureau of Classification at Central Office. It is now clear that the charges are coming from central office, not the warden or the institution, and thus we need to address central office to support Imam Hasan's hunger strike and to fight the conduct report he's facing. The charges are either baseless or designed to deny prisoners' political agency and inhibit their ability to organize. The person who signed the conduct report will also have the final say on Hasan's security level. It sounds like the authorities are considering expanded action against Hasan, and are set up to railroad him. We need to step up our support to deter them and to get his property and hard fought communication access back. Our demand is simple: drop the charges! 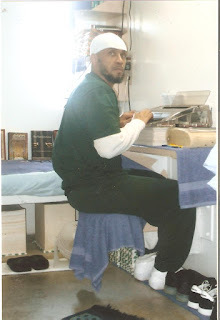 Free Imam Hasan! Call or email Director Gary Mohr at 614-387-0588 and drc.publicinfo@odrc.state.oh.us. "Siddique Abdullah Hasan has been on hunger strike since Saturday morning to protest the conduct report he was issued by Brian Wittrup on Friday. I am calling to stand with Hasan. Please drop these charges, meet his demands, return his property and return him to his previous status. Thank you." If we don't get enough pressure to reverse the conduct report, we can at least deter further action against Hasan. Please call Wednesday and the rest of this week, share this call to action widely and follow Lucasville Amnesty on Facebook for updates.